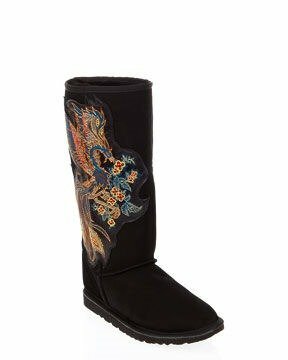 Black authentic Australian-made sheepskin tall boots with a large embroidered phoenix adorned with Swarovski crystal accents on outer side. Replaceable sheepskin insoles, super soft and warm genuine sheepskin lining, form-fitting foam footbeds, round toe, lightweight EVA soles. Guaranteed authentic, 1 available.